ONCE UPON A TIME, Melody Johansson had believed in happily ever afters. 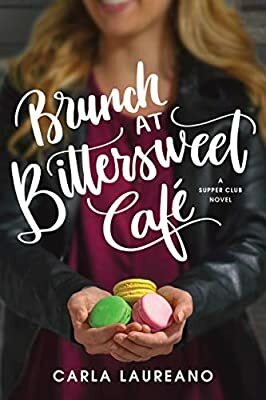 To be truthful, she still believed in them, but with her thirtieth birthday in the rearview mirror, the fairy-tale ending had turned away from meeting a handsome prince to owning a little patisserie in Paris. Even if sometimes, as she toiled away in her own version of Cinderella's attic, both fantasies seemed equally far-fetched. Melody brushed past the ovens in the bakery's kitchen, giving the loaves inside a cursory glance, then dragged a rolling rack of rectangular tubs from the back wall. Customers no doubt had romantic ideals of what it meant to be a baker, picturing quaintly dressed European peasants kneading loaves by hand and shoving them into ovens on long-handled peels, but the American commercial bakery had far more in common with an assembly line than a charming country boulangerie. Still, there were worse places to spend the dark, still hours of the night than surrounded by loaves of bread, their deep-brown, crackling exteriors fragrant with wheat and caramel and yeast. But Melody was closing on the end of a twelve-hour shift alone, and the only drifts she wanted to be enveloped in were the fluffy plumes of the down duvet on her antique bed. Not the hard, wet snow that coated the city like a sprinkling of demerara sugar on a freshly baked pastry. It looked beautiful, but the peaceful surface concealed treacherous sheets of ice, courtesy of Denver's mercurial warm- then-snowy March weather. Every time spring looked to be on the horizon, winter yanked it back for one last hurrah. Melody muscled a forty-pound tub of dough to the benchtop and overturned it in one swift movement. She'd done this enough in her career to judge two-pound portions by eye, but she still put each piece on the scale after she cut it from the mass with her steel-bladed bench knife. Unconsciously, she matched the cadence of her movements to the music softly pouring from the speakers. Cut, weigh, set aside. Cut, weigh, set aside. Then came the more complex rhythm of shaping each loaf. A dusting of flour, push away, quarter turn. Each stroke of the scraper beneath the loaf rolled the dough inward on itself, creating the surface tension that transformed the loose, wet lump into a taut, perfectly formed round. Then the loaf went into the cloth-lined proofing basket to rise before she went on to the next one. Twenty times per tub, multiplied by the number of tubs on the rack. She was going to be here for a while. Baking wasn't usually such solitary work. A second baker normally worked the weekend shifts to make up for the café's increased traffic on Saturday and Sunday, but he lived south of the city, just past the point where they had closed the interstate. It shouldn't have been a surprise—practically every storm closed Monument Pass. Had it been Melody, she would have driven up earlier on Friday morning to make sure she was able to make her shift on time. But then, she'd worked her entire adult life in restaurants and bakeries, where the first rule was: always show up. That meant her usual eight-hour shift had morphed into twelve. She muffled a yawn with the back of her arm. "Get it together, Melody. Only two more hours." Assuming the morning staff got here on time to put the proofed loaves into the oven. Maybe it was time to cut this job loose. She'd been here for six months, which, with the exception of a single fine-dining gig, was the longest she'd been in one place in her life. She needed variety. She could churn out someone else's mediocre recipes for only so long before she felt like she'd sold out. She'd been wanting to go back to Europe. She'd been away from Paris for eight years, and even then she'd been so busy as a baking apprentice that she'd never had the chance to explore France beyond the capital. A few months to travel sounded like heaven. Melody sighed. That was as much a work of fiction as any book in her extensive library. Based on the current state of her savings account, she could barely fund a trip to the airport, let alone any points beyond. She was heading back for a fourth tub when she heard a tapping from the front of the store. She frowned, cocking her head in that direction. Probably just the snow or the wind rattling the plate-glass windows. This strip mall was old, and every storm shook something new loose. No, there it was again. She wiped her hands on her apron and slowly poked her head out of the kitchen toward the front entrance. A man stood at the front door, hand raised to knock on the glass.